The movement “Yunarmiya” – is more than 300 thousand young patriots, 12 thousand troops throughout the country. In the military no longer an army, but a whole front! Managing such a mass of guys and girls is a serious matter. For this territorial branches are created. Each – with its own specifics. For example, Sevastopol or Petersburg cannot be represented without naval subjects. It is quite another thing – young men from Krasnoyarsk. What distinguishes the guys from the Yenisei? How does Unarmia live in a harsh land, where is the winter for half a year? The “MK” was told about this by the leader of the youths in the Krasnoyarsk Territory Denis THE BABY. – Denis Petrovich, what are they – young Siberians and Siberians? – Does the harsh Siberian climate make a mark? – Of course. Hence cohesion, the ability to appreciate friendship, readiness to help. It is much colder here than in southern and central Russia, the winter lasts longer. It has long been the custom: to survive, it was impossible to be a one-man. Only cohesion and friendship helped our ancestors survive in the harsh Siberia. Apparently, we got, as they say, at the gene level this feature. In general, we are for each other – a mountain! Probably, this is the feature that distinguishes us a little from other youth members. – In addition to the army structures still cooperate with someone? – In addition to the all-Russian unarmeal events, do you have your own competitions, where you can run and shoot plenty? ..
– Our local ynarmeyskaya “pearl” – this is a military-patriotic sports game “Siberian Shield”. This year they have not yet been held, but last year there was enough drive and excitement for everyone. Ran, jumped, shot and participated in intellectual competitions ten teams in two age groups. There exactly was enough for everyone and shooting, and the races for a time on the “cross-path”. For the first place they fought as if they were the Olympic Games! – Any movement, any organization is proud of its heroes, those whom you want to be equal to. Do you have such? – Of course. 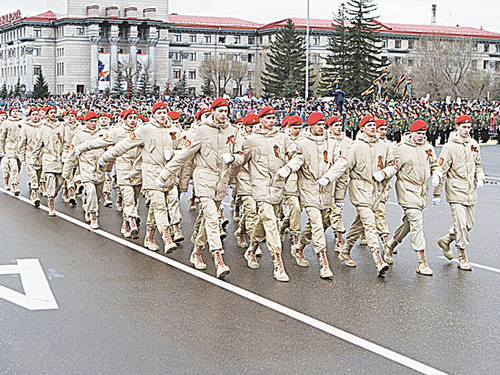 For example, the cadet of the youth center “Patriot” Azizbek Sufiev. He saved an elderly woman. On the way to the store, he saw that the woman was behind the balcony railings, and this was the sixth floor! Azizbek called an ambulance, the police, the Ministry of Emergency Situations. But he did not wait for anyone: he went up to the seventh floor and started to descend along the rope in order to save the elderly woman. Yunarmeets descended to her and escorted back to the apartment. So Azizbek saved her. – Yes, this is an act! But Yunarmiya is after all young, sometimes quite young boys and girls. It happens, naughty. Have you ever committed a wrongdoing and turned into an antihero? – Denis Petrovich, and what threatens those who still could not resist and violated the statute of the young soldier? – We have an item on this case about the expulsion from the ranks of Unarmii. Believe me, this is a very harsh punishment. Everyone who enters the ranks of unarmeytsy, swears an oath before the whole system. And for them to break this oath is the most terrible crime. – Have they never expelled anyone? “I don’t remember that.” On the contrary, many do the maximum possible to get us to Yarmarmia. – Of course. We have worked out a clear scheme for recruits. Anyone who wants to join Yunarmia must take an intensive training course. For six days, they acquire all sorts of skills and abilities. And only then the guys are allowed to the solemn ceremony of admission to youth soldiers. – What is included in the training? – Knowledge of topography, medical training, familiarity with tactics, army hand-to-hand combat and technical training. Acting fighters of special forces, representatives of power structures and public organizations come specially to these courses. So they give master classes to our children. – In fact, parents are very satisfied! They say that in children the discipline immediately appears, self-esteem. What was shirked earlier — for example, cleaning, washing floors, dishes — is now done conscientiously. Plus, children after such fees become more confident, friendly. – And there are already those who straight from Yunarmii went to repay the debt to their motherland? “In 2018 alone, 317 young soldiers came to military registration, of which we spent only nine in the army. This year already 190 young soldiers are preparing to stand under the banner of the Russian army. And do not be afraid of such a spread in numbers. Here I would like to say that among all 5916 young men there are no such people who would not like to go to military service: it is an honor for all young men. – Are there those who chose the path of a personnel officer and entered military schools? – Over the past year, ten young soldiers have successfully passed the entrance tests and are now studying at the Law Institute of the Ministry of Internal Affairs, the Academy of the Ministry of Emergency Situations and, of course, in the airborne school in Ryazan. – Yes, the big event that came to our land is the 29th Winter Universiade. Our young men act as volunteers, help organizers and participants. Our city went to this for seven years, and we are proud that the banner of Unarmia will also rise at this festival of sport. And we do not hit the face with dirt! Nice post. I learn one thing more difficult on completely different blogs everyday. It should all the time be stimulating to learn content from different writers and follow a bit of one thing from their store. I’d choose to use some with the content on my blog whether you don’t mind. Natually I’ll provide you with a link in your web blog. Thanks for sharing.